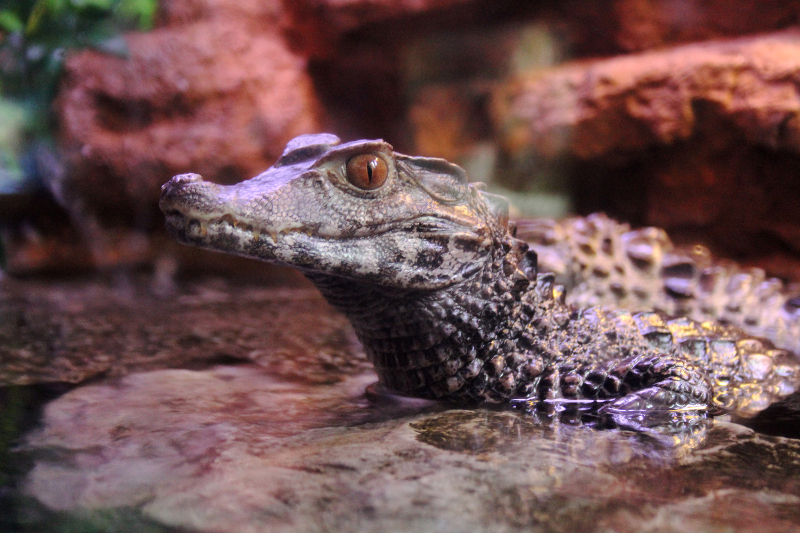 Native Range: Cuvier's Dwarf Caiman is native to South America. It is most commonly found in Brazil, French Guiana, Surinam, Guyana, and Venezuela (Grenard, 1991). Table 1. States with nonindigenous occurrences, the earliest and latest observations in each state, and the tally and names of HUCs with observations†. Names and dates are hyperlinked to their relevant specimen records. The list of references for all nonindigenous occurrences of Paleosuchus palpebrosus are found here. Ecology: This species can be found near rivers and inundated savanna areas. It has been known to occupy streams of varying sizes, where it is spotted resting near the shorelines. This species is also terrestrial, and can be seen on piles of small rocks and, river banks, and near decaying trees. P. palpebrosus is known to dwell in burrows up to 1.5-3.5 meters long. This species prefers colder temperatures and can survive as low as 6 °C (Stevenson, 1999). Paleosuchus palpebrosus primarily feeds on fishes as an adult, although they also take insects, frogs, crustaceans, and rodents. There is little data available on the breeding habits of this species. In Colombia, they nest between August and November during the rainy season; however, it appears that nesting occurs in the dry season in Brazil. Their mound-like nests have been found on floating vegetation, but most often are on the forest floor. The female lays between 13 and 15 eggs. Incubation is 90–92 days long (Stevenson, 1999). Means of Introduction: Pet trade. Status: Presumed to have failed. Krysko, K.L. and 12 others. 2011. Verified non-indigenous amphibians and reptiles in Florida from 1863 through 2010: Outlining the invasion process and identifying invasion pathways and stages. Zootaxa 3028:1-64. Stevenson, C. 1999. The Paleosuchus Page. Available from: http://crocodilian.com/paleosuchus/. Accessed 3/5/2013.